Once the chickpeas beans are soaked and ready to go they only need about 15 minutes under pressure and 10 more minutes of rest to be fully cooked. Then, just pop open the pressure cooker, add the pasta and it’s just a few more minutes to a cozy, healthy, and delicious minestrone soup. A peasant dish has never been so tasty, or fast! In the pre-heated pressure cooker add a swirl of olive oil and soften the onion, carrot and celery. Add the herbs and stir them around for about a minute. 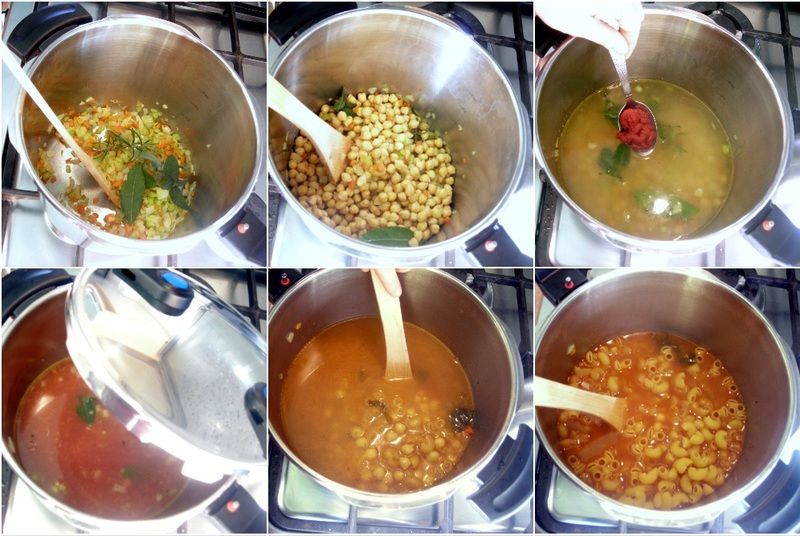 Then, add the chickpeas, water (4 cups or 1L) and tomato puree'. Electric pressure cookers: Cook for 18 minutes at high pressure. Stovetop pressure cookers: Turn the heat up to high and when the cooker indicates it has reached high pressure, lower to the heat to maintain it and begin counting 13 minutes pressure cooking time. Remove the woody stems that remain from the herbs and the whole bay leaf. Add three cups (750 ml) of water and season with salt and pepper. Bring the contents of the pressure cooker to a boil, without the lid closed (use the saute' or brown button for electric pressure cookers), add pasta and cook, for recommended time on the pasta package (without pressure). Serve with an optional dusting Pecorino Romano. Oh wow…that looks so good…bookmarking this…thank you! Hugs! thanks for all the recipes! I take a pressure cooking class on Saturday! So exciting! Thank you for your feedback, it keeps me cooking and creating! My husband is getting a little tiered of all this innovation and is starting to ask… can we have some “normal” pasta, now? I make the recipes a week or two before I post them and Meat Month is proving to be a challenge – since we usually don’t eat it more than once a week! I think I’ll be making lots of soups for November so we can recuperate from the feast! Looks great! Love your blog. After resisting for years, I am succumbing to the charms of pressure cookers. They’re used a lot in Spain, where I live, and I’ve also realised they help make it really easy for kids to cook ‘proper’ food without either burning it or getting bored. Took the class on Saturday and it was really fun! Plan on using some of your recipes for sure now! Now, I have re-arrange my kitchen cabinets so I can reach my pressure cooker better! upnorth, I look forward to hearing about your pressure cooker adventures! My pressure cookers are in the one cabinet I couldn’t photograph because of lighting issues – a corner cabinet with an interior carousel. I love it, love it, love it! this is great! the only way to make chickpeas is in the pressure cooker! Well, unless ur eating canned, which I’d then start to wonder, but I’ve done it, so I’m guilty! Have a great weekend. Welcome, Bren! I, too, used to keep a few cans around for “bean salad emergencies” but ever since I stumbled across the “quick soak” method – which only takes 10 minutes and replaces the overnight soak in every respect (except maybe visually) I kicked those cans to the curb. How does one adjust the time for a larger or smaller piece of meat? I’m not clear on that. This calls for a 3 lb piece of meat. What if I only have 1.5 pounds. I’m sure that just cutting the time in half probably isn’t the right way to do it but what is? How much water should I put in with the chickpeas? Recipe later calls for three cups, but looks like I need more than one cup to cook the beans. Natasha, the recipe lists water twice. 4 cups to cook the beans and then afterwards you add three cups more when you add the pasta. I have changed the text in the recipe to make this clearer. Actually, since I noticed this is an older recipe I updated the pressure cooking instructions to include electric pressure cookers and I also added nutritional info. Can I use chicken stock in place of water for the pasta boiling step? Yes, you can use chicken stock, instead. I used dried herbs based on my location, and fresh homemade chicken broth for the pasta part, the rest followed, this is a keeper and worthy of 10 stars. Thank you for the great recipe.